OUYANG Jiao Jia , painter and calligrapher was born in 1947 from educated parents settled in Shangai. Drawing and painting are a real passion from an early age on. In 1960 he starts private tuition in Chinese painting with Master ZHOU . In 1963 he joins the very famous and selective School of Fine and Handicraft Arts of Shangai, from which he graduates in 1968. 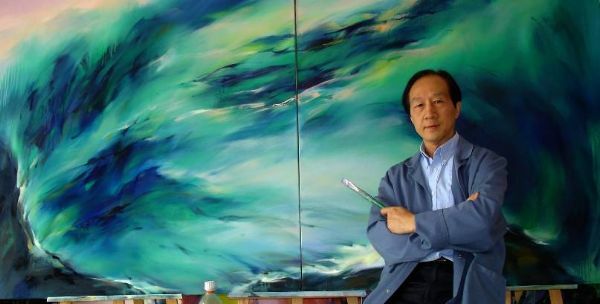 His paintings are regularly exhibited in Beijing and Shangai . In 1988 he settles in Toulouse and enrolls in the Ecole des Beaux Arts (Schol of Fine Arts) of the city. That same year an exhibition of his paintings is held in the gallery "L’Atelier" . Since 1990 he has been regularly holding exhibitions in different art galleries and various Art fairs throughout France, while teaching painting and Chinese calligraphy. In 1995 , he issues, together with L.POLASTRON , the book "Chinese Calligraphy", published by FLEURUS, Paris. From 2000 onwards , he settles in his own very personal style, which combines eastern and western influences. His works have been awarded many prizes and greeted favourably by critics and media .